Fran Heath was the oldest of the Hot Curl surfers, but only by a couple of years. His family moved to O‘ahu when he was an infant. The Heaths lived in the Kahala section, a coastal strip just on the other side of Diamond Head crater from Waikiki. He would have been native born except for the fact that during a visit of his mother to relatives on the U.S. Mainland, the Matson steamship company refused to take her back on board for the return trip. Mrs. Heath was far along in her pregnancy and, in those days, the passenger ships between Hawai’i and the West Coast only averaged a speed of around 11 knots. The typical trip between Honolulu and San Francisco could take between 14 and 16 days. Thus, Francis R. Heath III was born in Oakland, July 13, 1917. 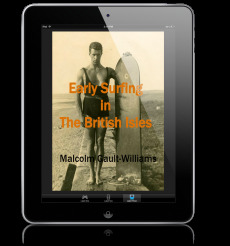 Fran started surfing around the age of 12, at the very start of the 1930s. He was a member of the Outrigger Canoe Club at an early age, beginning his surfing life on an 8-foot redwood board. Favorite spots to surf when he was first underway included the old pier in front of the Ala Moana Hotel, Sandy Beach and Black Point. Out of the half dozen or so guys he first started surfing with, all but Lex Brody would go on to ride Hot Curls. Although Fran and friends were not attracted to Blake’s hollows, partially-hollow boards were a different story. Fran was the first to have a semi-hollow, ordered from Pacific Coast Redi-Cut Homes, back on the Mainland. This board would later become the first Hot Curl surfboard. Dad Center had been surfing Waikiki since surfing’s revival, prior to World War I. In fact, he was out surfing with Duke Kahanamoku the day Duke caught his now-famous half-mile ride in 1917 – the longest single ocean ride in recorded history. Dad later became the canoe coach for the Outrigger, coaching not only Fran, but others who would go on to make names for themselves in the surfing world – like Rabbit Kekai. Strategically, Dad Center owned a good deal of Waikiki at one point and was the main connection for redwood shipped over from the U.S. Mainland. “When we first began surfing in the early ‘30s,” Fran said of the Empty Lot Boys, “we were led to believe Waikiki was the only place waves could be surfed. When John Kelly, Herky Best and Dougie Forbes moved to Kahala and Black Point, it became obvious to us when walking home on Diamond Head Road, that there were some fabulous surfs both off Black Point and Diamond Head. “I don’t know, but unconsciously I probably tried to emulate him. You know, when you admire someone doing something – you want to improve however you can – so, you know, I’m not afraid to learn from somebody else. “Fran – it was like he was part of the board. I always admired that. When you saw him on a wave or were with him on a wave... he just seemed to be part of that board; so much a part of it, it was just like one thing. “He was just – smooth. You know, like the way you catch the wave and stand up... It was just like fluid motion. Beautiful. “So, we waited and Fran started catching waves – just so beautiful, you know. Toward the later part of the war, both Kelly and Fran were assigned to UDT duty. The Underwater Demolition Team was the predecessor of today’s Navy SEALS. Fran admitted that the swimming and diving was not a problem; it was the demolitions. “We had to learn all about explosives. I mean, we were handling explosives strong enough to blow up an entire building – in our case, powerful enough to sink a metal-hulled ship. As the Hot Curl guys grew older and were super ceded by younger surfers from both Hawai‘i and the U.S. Mainland, most all of them still continued to surf, stay close to the ocean, and carry on as tribal leaders in surfing’s development. The exception was Fran Heath. Fran continued bodysurfing, fishing and boating – both power and sail. His wife Juliette had praises for her husband’s ability to surf waves even with a Boston Whaler. From the glow in her eyes, telling of one particular instance, I got the impression Fran did this on big days as well as small. Continuing to bodysurf, Fran was one of the first to do so at Pipeline and Waimea. “Buddy Adolphsen surfed with us when I was young. Later, after World War II, he became a sergeant in the police force. When he was stationed on the North Shore, he devoted himself to lifesaving. A lot of people don’t know, but Buddy was responsible for many a save on the North Shore before they had lifeguards there. “Anyway, this one time I was bodysurfing Waimea when it was pretty big; no one else out... After a while, I noticed fire engines on shore and a lot of people congregated. I wondered what had happened, cuz I hadn’t seen anybody else out riding those waves that day. At the end the day I spent with Fran, interviewing him, I went with Fran and his wife Juliette, over to Wally’s place to show me his Pacific Systems semi-hollow Hot Curl which Wally had recently refurbished. It’s a beautiful board; beautiful in materials and beautiful in shape. I was also struck with the heavy weight – at least by today’s standards. At one point, I was concerned about Fran. I mean, the guy was an octogenarian by that point and walking around with a cane. How could he lift even half the weight? Well, that day he hefted his end of the board; no problem. Outside, under the Honolulu sun, he gave me directions on slinging it over my shoulder so we could take a picture of it. At a certain point, Fran clearly got frustrated with my lack of expertise handling his board. “You don’t know how to carry a surfboard,” he said, almost scolding me while cradling the semi-hollow in his arms. Fran showed me how to sling it over my shoulder with one hand in a perpendicular fulcrum. It was then that I fully realized what it was like back in the days of the Hot Curls, when Fran, Wally, Kelly and them slung their boards on their shoulders on a daily basis. It was the only way you could carry a heavy redwood board. 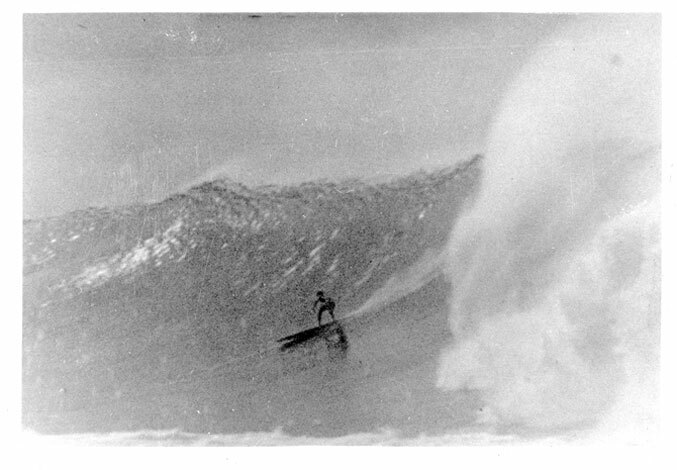 Lost in time is not only this practice, but also the Hot Curl surfboard’s place in the rack as the grandfather of today’s big wave guns. Contemporary board design for what Buzzy Trent originally labeled the “Elephant Gun” still reflects many Hot Curl principles, including forward V, tail V and pulled-in gun plan shapes. So it goes for the Hot Curl guys, themselves. Nearly forgotten or overlooked, it’s The Empty Lot Boys who were the first surfers in modern times to regularly ride the biggest waves the island of O‘ahu has to serve up. They rode all the island’s shores – including the North Shore – at least a decade before the arrival of those who would later get the kudos for it. Gault-Williams, Malcolm. Interview with Fran Heath, April 2, 1996. See also Gault-Williams, “Fran Heath: The Forgotten Hot Curler,” Longboard, Volume 5, Number 1, March/April 1997. Gault-Williams. Interview with Fran Heath, April 2, 1996. According to Fran’s recollection, he ordered the board in 1935 and it arrived in 1936. This is consistent with Wally’s recollection as this board being the first Hot Curl, which was cutdown around 1936-37. Blake, Thomas E. Hawaiian Surfriders 1935, published by Mountain and Sea, Redondo Beach, ©1983. Originally titled Hawaiian Surfboard, published in 1935, by Paradise of the Pacific Press, Honolulu, Hawai’i, p. 55. See also Kahanamoku with Joe Brennan, World of Surfing, ©1968, Grosset & Dunlap, New York, pp. 73-80. Gault-Williams. Interview with Woody Brown, Pa’ia, Maui, November 22, 1994.